Six String Nation and the Bingorage checkup. The Six String Nation is a guitar made of sixty+ pieces of Canada, including Rocket Richard's Stanley Cup ring, Louis Riel's first coffin, Wayne Gretzky's hockey stick, Halifax pier, Doukhobour grain silo, mammoth ivory, pipestone, carved caribou antler, whale baleen and wood of The Golden Spruce. Six String Nation FLASH-Player presentation of the guitar parts and origins. Following pics click to enlarge. Bass 1, 3 and 2. Juggle-monkey; papier-mache and modeling clay. Installing art at the paintball park. Click door for link to our Spirit Fire Paintball Park blog. I decided to try some freeform papier-mache sculpture in the trees. Will get some better pics as I work out the details. Hope it doesn't rain soon; before I get to finish and seal the work. Click to enlarge (Pics kinda dark; same piece.). Changes have been made to the FFCBC papier-mache bass sculpture. My inaugural Bingorage/Broken Vulture Art podcast with Odeo.Com; click the play button (less than ten minutes long). I started this sun-motif bead embroidery in December, but hadn't touched it since February. I picked it up yesterday and made some progress. It feels good to move things off the backburner, doesn't it? One of my customers at the Clover Valley Farmers Market asked me to do a piece for his daughter, a couple months ago. I agreed, but admitted that the piece wouldn't be first priority until the FFCBC bass was finished and displayed. The clay base for the relief was rendered on one of my worktables... and then buried under styrofoam offcuts, ripped paper-bag scraps and other flotsam. I finally dusted it off and put a new, complete layer of papier-mache on it, last night. It will probably need another layer before I put it to paint. I used Jumpcut, an online video editing and hosting site. Unlike Youtube, which doesn't (yet) have an editing feature. I am working on a second papier-mache bass sculpture (bottom right of pic), that will probably not be painted in a naturalistic manner; but, used as a "canvas" for a scene. I have added some 'blue circles' on the side of the first bass, perhaps to contain some sort of secondary imagery. The painting, Pungi Wiisii Niias was ripped when another canvas fell against it (detail pics, here). I'll figure some way to incorporate the fix, in the final composition. Another "Kennewick Man" article at NewScientist.com . In 2004 a federal court ruled that a law giving Native American tribes control over their ancestors' remains does not apply to Kennewick Man - one of the oldest skeletons ever found in North America - because no present-day tribe can prove kinship. As a result, anthropologists were free to study it despite objections from tribes that claim a link through their oral history to the skeleton they call the Ancient One. 1- Supposedly, he looks like Captain picard. 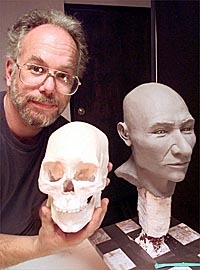 The facial reconstruction that was made of his skull appears to have "Caucasian" features and looks much like P. Stewart. Personally; I think it's wishful thinking, combined with missing hair and tan. Certain scientists and politicians have seized upon his possible European origins; hoping to claim an earlier "European arrival" in North America. Recent finds in Eastern North America have hinted at a possible Solutrean (ancient France)-influenced stone tool assemblage; Clovis points are similar. 2- NAGPRA (Native American Graves Protection and Repatriation Act) requires today's tribes to 'prove' tribal affiliation with artifacts or ancestral remains in museums, university labs or gov't storage in order to get them back for reburial (bodies and grave goods), ceremonial use (ceremonial items) or tribal collections. it does not diminish an increasingly deep Native American presence in the Americas. if they weren't terminated, shortly after arrival. I think that I should start making movies. I need to channel my inner David Lynch. Check out these random thingies. Update: August 18. I should have made it clear that these three clips are not mine, they are just a few things I found at Youtube. You can see my personal Youtube channel, Reason Butcher TV, here. Some pictures of the bass; at The Adventure Inn. And... back at Bingorage studio. LTTA artist wins prize at Gimli fim festival. 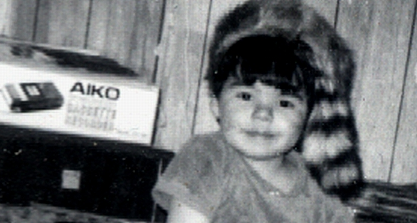 Photo courtesy of CBC.CA; copyright Darryl Nepinak. L'Atelier also commissioned Nepinak to put together an evening of films made by aboriginal filmmakers. Nepinak told the sold-out crowd the straightforward goal of the "Indianpeg" program was "to show what Indians have been up to in Winnipeg." I met Darryl at an LTTA Aboriginal/New Media artist workshops in Toronto, last November. We met up again, coincidentally, in Winnipeg this spring, while my mother was in hospital, there. Darryl asked me to give him a hand with a little project he was working on; a "ghetto talk show". I laughed, just thinking about the working title. We did some filming down by the river and took stills with my camera, but it crapped out and the riverside pics were lost. Here's a few from around the apartment complex where some other footage was shot. I haven't seen the film, yet, but I'm really looking forward to it now; see if any of my bits made the cut. Congrats Darryl. The following pics click for enlargement. Shovel mask tours Fort Frances; decides to hang out with Totem Pole, for awhile. Shovelmask; in the Bingorage studio. Shovelmask; on the Rainy River. Shovelmask; at Pither's Point Park.